Yin and Yang – two opposing forces that represent connectivity and balance. Yang represents heat, masculinity, movement and “doing”, while Yin represents the qualities of stillness, coolness, femininity, resting and “being”. Depending on the style of Yoga, will dictate whether it’s more “yin” or “yang”. Ashtanga focuses on strength, stamina and dynamic movement, so is classified as a yang style of yoga. Yin yoga however, is completely different – long-held poses done on the floor with an emphasis on mindfulness and surrender rather than strength and perfect form. Yin Yoga can be so transformative and feeds our need to balance our mind, body and spirit. 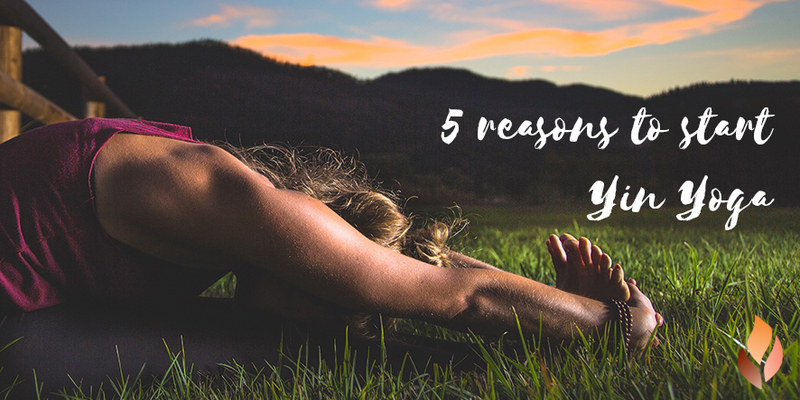 Here’s 5 reasons why you should DEFINITELY give Yin yoga a try! We all lead busy lives, whether that’s with work, kids, exercise and life in general! We’re always on the go, and whilst this helps up to achieve goals, we often struggle to slow down, let go, take it easy and just be in the moment. Being constantly on the go can burn us out and can lead to exhaustion, depression and stress-related diseases. We naturally seem to lead a “yang” life – which is why we need yin yoga to balance ourselves. Yin is a refreshing change to the high-intensity, super energetic, sweat-through-the-mat yoga such as Vinyasa, Hot Yoga and Ashtanga. The deep, long-held poses of yin yoga focus on releasing built-up tension in the fascia or connective tissue. This is unlike the more intense styles of yoga which move quickly through strength-building standing poses that work on your muscles. As we’ve mentioned, yin is all about the long-held poses. This is great because we aren’t necessarily “doing” a whole lot. It allows you to embrace the silence, shift down a gear and surrender. Your mind and body can enter into a deep state of relaxation. With the focus on noticing the breath and the sensation in the body, it’s a fantastic way to move into mindfulness and meditation. Yin yoga is a good counterbalance to other yang styles of yoga such as running or working our at the gym. These intensive types of workouts can not only lead to joint wear and tear, but habitual tightness in certain areas of the body. The yin postures can prevent the risk of injury and the practice helps to cultivate awareness and acceptance of your body’s natural limitations. The yin yoga teaches you how to be more patient, accepting and compassionate with your body and mind. These qualities are transferable to other areas of your life as well. The things that bug you and push your buttons will become dull and insignificant. You’ll remember that it’s not such a big deal and that it’s ok to just be.